Summer is the best time to enjoy the endless options of produce that tends to only be available for a few short months. The infographic below from Health Central outlines some of summer's best fruits and vegetables, and their health benefits. Experiment with some of the season's finest harvests before it's time to get your coats and mittens on again. Avocados are a great summertime fruit that provides lots of nutrients like fiber, vitamin K and potassium, and are best served raw as part of a salad. Cucumbers are another great addition to your warm-weather diet, providing vitamin A, K and magnesium. They are also best served raw in salads, sandwiches or dips. Other great summertime produce includes summer squash, tomatoes, cherries, melons, strawberries, and peaches. 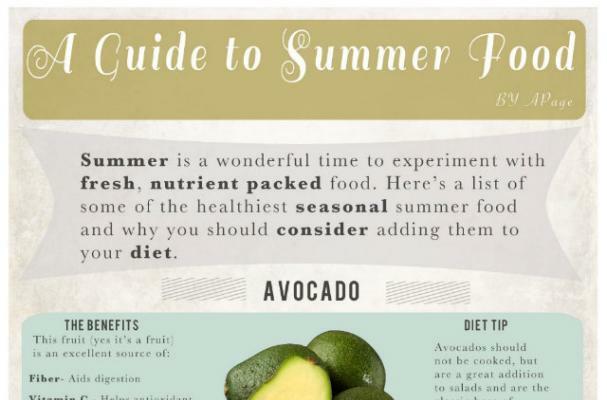 Learn more about summer foods in the infogrpahic below.